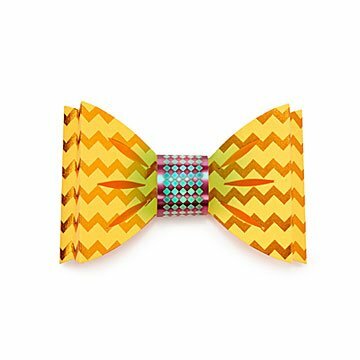 Kiddos build an electrical circuit that lights up a set of super-snazzy bow ties with this STEAM kit. Smarts meet style with this STEAM-approved craft kit: It teaches kiddos how to build an electric circuit that lights up a set of super-snazzy bow ties. Designed by Natasha Dzurny, each set contains all the supplies needed to put together ten glowing bows that can easily attach to anything from a shirt collar to a hair tie. Make it a birthday party activity with a better-than-a-goody-bag gift to take home, or just save it for a rainy day spent inside—either way, as the kids say, "it's lit." Made in New Jersey. As passionate about arts and crafts as she is about technology, Natasha Dzurny finds a special kind of joy in combining the two. Using skills she learned at the Savannah College of Art and Design, and in Interactive Communications at New York University, she works in both education and design. When she isn’t developing new products, she’s running workshops in the New York City area for young students, hopeful crafters, and major companies. Her STEAM-inspired craft kits are designed to shine a light on the intersection of science and art—perfect for young kids (and the young at heart).